Euro MPs have heard claims that EU companies are exporting equipment used for torture despite legislation aimed at preventing such trade. Amnesty International has published a report detailing the claims, and was briefing the European Parliament's Sub-Committee on Human Rights. The equipment includes thumb-cuffs and devices that give electric shocks. Amnesty said firms from Germany, the Czech Republic, Spain and Italy were among those trading the items. However, it also said that only seven of 27 EU member states had publicly reported on such exports. Amnesty, which co-published the report with the Omega Research Foundation, said companies were using legal loopholes to evade restrictions introduced by a 2006 law. Under the law, trade in items that are deemed to be designed for torture is banned outright. There is also a list of restricted items, which could be used for medical or security purposes, and their trade is meant to be monitored. Amnesty said several EU member states, including Germany and the Czech Republic, had authorised the export of items from this list. But it also said they were among the few countries to have publicly disclosed their exports. In some cases the equipment had been exported to countries where Amnesty said it had documented their use for torture or other ill-treatment. 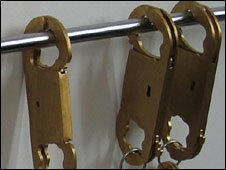 Examples included electric-shock devices and shackles being sent to Mongolia, and electric-shock devices going to Georgia, Pakistan, Moldova, Senegal and Cameroon. Amnesty's David Nichols said the emphasis should shift to checking where the equipment was ending up. "Pepper spray is a legitimate security device, however if a company or country is exporting pepper spray to a country where there is evidence of it being used for torture in the past, that should ring alarm bells," he told the BBC. Amnesty is pressing for some items, including electric-shock cuffs, thumb-cuffs and finger-cuffs, to be moved from the restricted list to the banned list. Mr Nichols said some companies were getting round restrictions by renaming devices or modifying their design. "There's been absolutely no monitoring of the implementation of the regulation," he said. "We're hoping that the MEPs will be able to put pressure on the Commission and member states to do their job." The European Commission said in a statement that it was taking the Amnesty findings "very seriously" and would "examine the suggestions in the report with great attention". It also said it would examine with member states "the full implementation of the regulation".